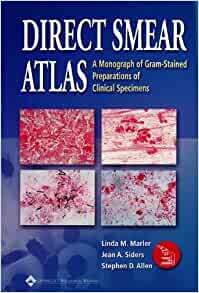 This atlas is a full-color, spiralbound manual of Gram-stained direct smears for medical technologist and medical laboratory technician students and practitioners, microbiologists, pathologists, infectious disease specialists, and anyone who interprets Gram-stained specimens. Featuring over 250 clear photomicrographs taken from actual patient specimens, the manual presents a simple, easy-to-use format; brief legends accompany each image. Three introductory chapters cover Gram-stain procedures, quality control, evaluation, and more. An invaluable reference and educational tool. FEATURES: Complete coverage contains over 90 species of microorganisms, with separate sections on artifacts and cells, to provide needed experience in reviewing slides. Also includes 3 introductory chapters addressing procedures, reagent and smear preparations, quality control, bacterial morphotypes encountered, and evaluation of the Gram-stained smear. Full-color, quality images- images are clear and consistent in magnification (1000X) with high resolution and true color. Cross-referencing images are arranged in sections according to specimen site (wound, blood, etc), then alphabetically by organism name. Images are also cross-indexed alphabetically by organism name, morphologically by Gram stain and also by clinical diagnosis. Real-life rather than only text-book images commonly seen decolorized species and their more classic stained forms, artifacts, and other examples of real-world microbiology are included. Easy reference format - makes this atlas the perfect microscope reference! Companion to CD-ROM Version both the Direct Smear Atlas CD-ROM and this monograph may be used as a review for competency testing. The CD-ROMs self-testing mode can document competency. Very good reference. Good idea about quality control. Delivered as promised and as expected.Book is truly helpful especially for practicing professionals. Please change the binding of the book to a more sturdier kind. This atlas has been very helpful for staff new to reading gram stains. Everyone loves it. We refer to it daily.